More and more people are becoming familiar with the chemical known as “oxytocin.” The sudden increase in knowledge is partly due to scientists and researchers making their results publicly known- and the results are usually pretty fascinating. Neuroscience and Biobehavioral Reviews recently published a study that has the scientific world buzzing. What was so interesting about this particular study? Researchers found that oxytocin, a.k.a. 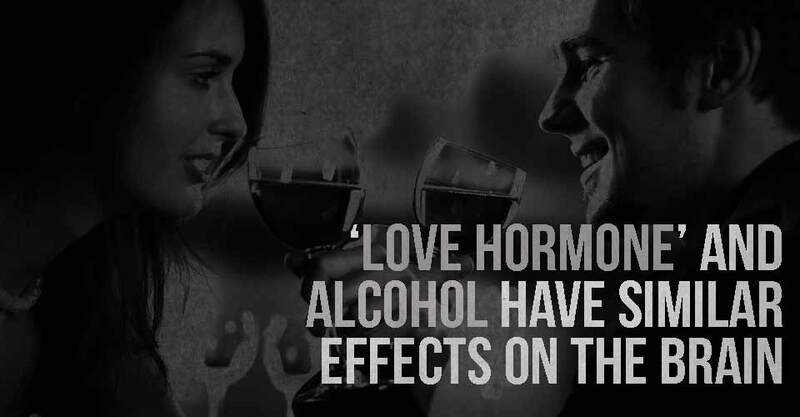 “the love hormone”, and alcohol have almost identical effects on psychological behaviour. If you’re not an oxytocin guru and need some basic information on the hormone, I’ve got you covered. Dubbed the “hug hormone”, “cuddle chemical”, “moral molecule”, and “bliss hormone”, oxytocin’s effects on behaviour play a crucial role in our lives. Oxytocin is classified as a nonapeptide in chemistry, and a neuropeptide in biology- meaning it acts as both a hormone and a brain neurotransmitter. Also, when oxytocin is released into the system, multiple psychological effects influencing social behavior and emotion are experienced. Hmm… That last part sounded similar to the effects of alcohol. The School of Psychology at the University of Birmingham had a similar thought, which brought them to this study. But the similarities between the two don’t end there. The negative effects of alcohol and oxytocin were also found to be the same. Both can cause people to become more aggressive, more boastful, and envious. One of the more dangerous effects that both share is the increased risk factor. These compounds can affect our sense of fear and anxiety, causing us to participate in more risky and dangerous behaviour.